All brides want to look their best while still honoring their religious beliefs, which is why selecting amongst appropriate Jewish wedding dresses is very important to the Jewish bride-to-be. The style of gown you can wear will depend on your particular set of beliefs within Judaism and the requirements set forth by your synagogue. Many churches, synagogues, mosques and other places of worship offer their own wedding planning guides for couples who want to get married. The guides usually contain information regarding attire rules for the ceremony. 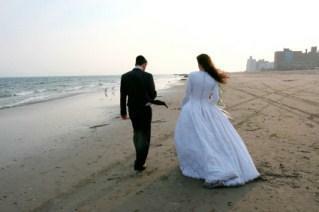 For example, Chabad.org offers guidelines on planning a wedding, which also includes dress guidelines. Any questions brides may have can be directed to the rabbi before they start wedding dress shopping, in order to avoid purchasing an inappropriate gown. Though particulars of the guidelines differ, many liberal Jewish brides can wear virtually any style they desire, from halter dresses to mermaid gowns. While white is encouraged due to the symbolic meaning of the color, many brides in more liberal sects can wear dresses with hints of color. Sometimes, the particular synagogue may require the bride to cover her shoulders or arms for the Jewish wedding ceremony; however, this is easily accomplished with a wedding bolero jacket or shawl. Orthodox Jewish brides, or brides from more conservative Jewish denominations, may need to wear modest wedding dresses that have long sleeves and high necklines. They should consult with their rabbi and synagogue before selecting a gown, as requirements are usually fairly stringent. Women who follow the tenets of tseni'ut, or modesty, within Judaism should make sure their wedding day attire fits with the practice. After consulting with your rabbi and synagogue about any Jewish wedding dresses guidelines, it is time to buy the dress itself. If you have strict requirements for the gown, your synagogue may actually have a list of recommended boutiques in the area that carry dresses which fulfill the requirements. Otherwise, call area bridal boutiques and set an appointment to try on wedding dresses. Bring along a copy of the Jewish dress information so you can be sure your gown is appropriate. If you are struggling with finding an appropriate wedding dress, it may be necessary to visit a nearby metropolitan area that offers a larger selection of proper gowns. For example, brides in the New York and New Jersey area can visit Couture De Bride by Tova Marc to find their dream wedding gown. Another option for brides who cannot find a dress they love that still fits into the attire guidelines set forth by their synagogues is to have a custom wedding dress made. This way, the gown is sure to not only meet the requirements, but also be the perfect fit and style for the bride-to-be. Of course, not every bride has the time or money to design their own dress. A gemach is a type of lending and loan system within the Jewish community. Many brides who want to wear used wedding dresses can find bridal gemachs or gown gemachs in larger cities. Each gemach will have different rules regarding the dresses, but many require a small to moderate fee (though still well below the cost of purchasing a gown). Some ask that the gown be returned in good condition, while others may allow you to keep it. Check with your local gemach for more information on seeing their selection of Jewish wedding dresses. While finding the right Jewish wedding gown is important, having a beautiful wedding veil is necessary for brides who are having a bedeking in their ceremony. Purchase a wedding veil that matches the style of your dress and your Jewish wedding ensemble is complete.